Typically, one-tenth of a gram of Crystal Meth in tablet form costs $5.00 and may range up to $20.00 (which is usually imported from Europe, and may be sold as ecstasy). The use of Crystal Meth goes back into the late 1960's but because of numerous successful campaigns, the drug was cleared off the streets in the 1970's. However, in the early 1990's the market for Crystal Meth reopened and today it is one of the most commonly abused illegal substances. The manufacturing of a pound of Crystal Meth can produce about six pounds of toxic waste. Methamphetamine is classified as a Schedule II substance under the Controlled Substances Act. Schedule II drugs, which include cocaine and PCP, have a high potential for abuse. Abuse of these drugs may lead to severe psychological or physical dependence. In 2005, the National survey on Drug Use and Health (NSDUH) released their Crystal Meth statistics. Their survey noted that 10.4 million people 12 years old and over have tried Crystal Meth at least once in their lifetime. 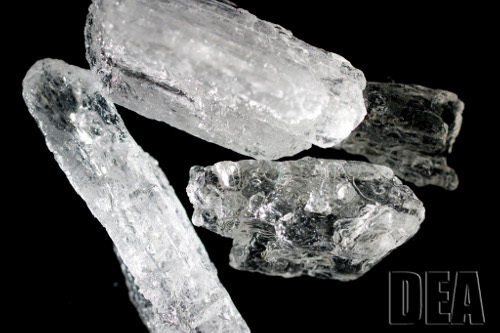 Approximately 1.3 million people reported using Crystal Meth between the year 2004 - 2005 and 512,000 reported using Crystal Meth within the last month this Crystal Meth statistic was taken. According to the University of Michigan's Monitoring the Future Survey, nearly 5 percent of high school seniors in the United States used crystal meth at least once in their lifetime and 3 percent used the drug in the past year. The number of annual internet searches for "meth", 14,013, and "Crystal Meth addiction", 12,173, add credence to concern about this highly addictive stimulant. Similar to other substance abuse inquiries, people are often looking for information about "addiction treatment"' (3,356 occurrences annually), and "addiction symptoms" (3,333), in relation to Crystal Meth addiction. The average high from Crystal Meth lasts between 4-12 hours. It takes 12 hours for the user's body to remove 50% of the drug from their system. Crystal Meth use is associated with numerous serious physical problems. The drug can cause rapid heart rate, increased blood pressure, and damage to the small blood vessels in the brain--which can lead to stroke. Chronic use of the drug can result in inflammation of the heart lining. Overdoses can cause hyperthermia (elevated body temperature), convulsions, and death. Crystal Meth users who inject the drug expose themselves to additional risks, including contracting HIV (human immunodeficiency virus), hepatitis B and C, and other blood-borne viruses. Chronic users who inject Crystal Meth also risk scarred or collapsed veins, infections of the heart lining and valves, abscesses, pneumonia, tuberculosis, and liver or kidney disease. It is estimated that nearly half of all the major crimes in the United Sates can be attributed to meth and other drugs of addiction. This statistic is based on the fact that at least half of the suspects arrested for violent crimes (i.e. homicide and assault) were using meth or another drug at the time of their arrest. When a person continues to take meth it destroys their ability to experience pleasure naturally without being on drugs.